The main thing I love about the Northern Lights Village is that it is the only place we sell which is dedicated to Aurora accommodation only. This means that you really do maximise your chances of seeing the lights, even outside of the dedicated Aurora hunts. When I was in my cabin, I constantly found myself gazing up at the sky above my bed, fighting sleep for as long as I could. When I noticed a flicker of green I was overcome with excitement. I got dressed with my PJs under my winter clothing and watched with the other guests as the display became more animated. It was an unforgettable experience. 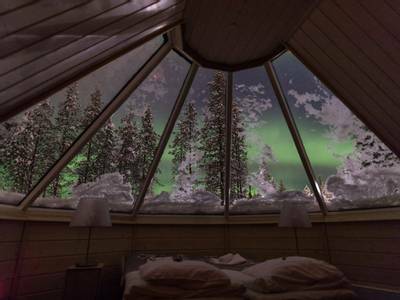 Saariselkä, Finland has a fantastic Northern Lights record and during your 3 nights here, you’ll stay in a glass-roofed Aurora Cabin to give you the chance of seeing this amazing display right from your bed. 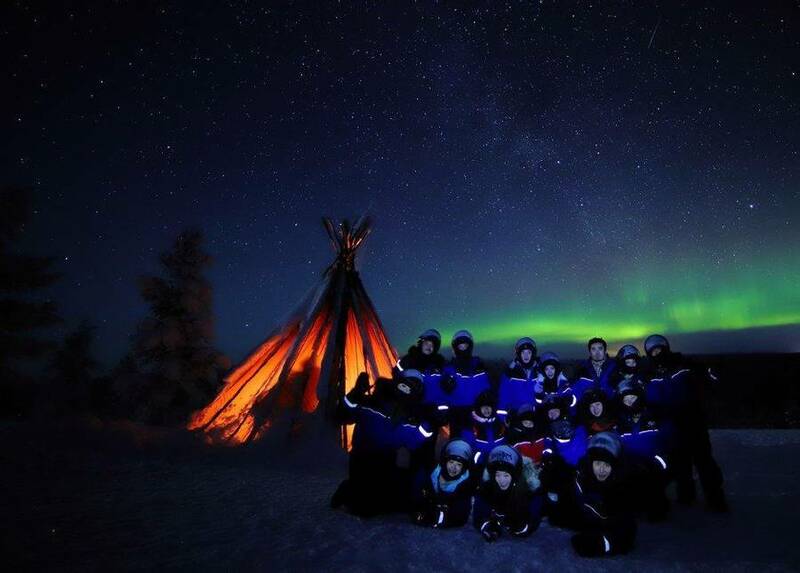 There’s also dedicated Aurora activities as well as an unforgettable husky safari included. 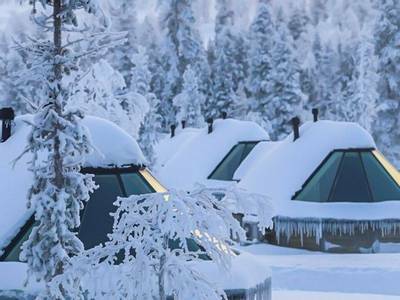 Saariselkä is located in the far north of Finland, high above the Arctic Circle. It is at the heart of the Aurora Zone and the winter nights ensure excellent conditions for seeking out the Northern Lights. 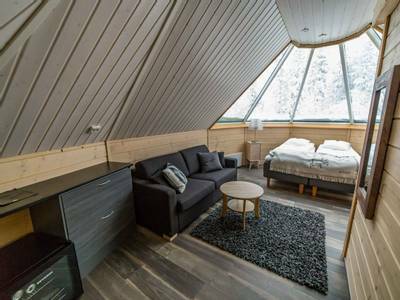 To maximise your chances, you will spend the duration of your stay in a north-facing, glass-roofed Aurora Cabin, which is protected from the artificial light of the town by thick forest. You may find yourself fighting off sleep in order to keep an eye on the sky from the comfort of your bed. 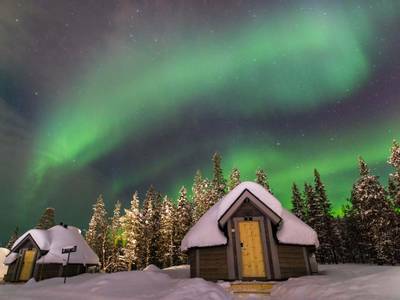 The Aurora Cabins lie on the doorstep of a natural winter playground and we include evening activities, which not only focus on seeking out the Northern Lights but also provide some unforgettable Arctic experiences. On your first night, we will introduce you to the region and the Northern Lights during a visit to a remote Aurora Camp with an expert guide. Next, you’ll hunt the lights on foot using snowshoes and enjoying the silence of the wilderness. 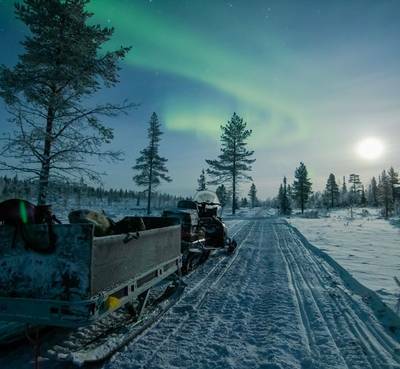 You’ll then have the chance to either visit the Russian border area for an Aurora stake-out or take to the trails for an Aurora snowmobile safari. 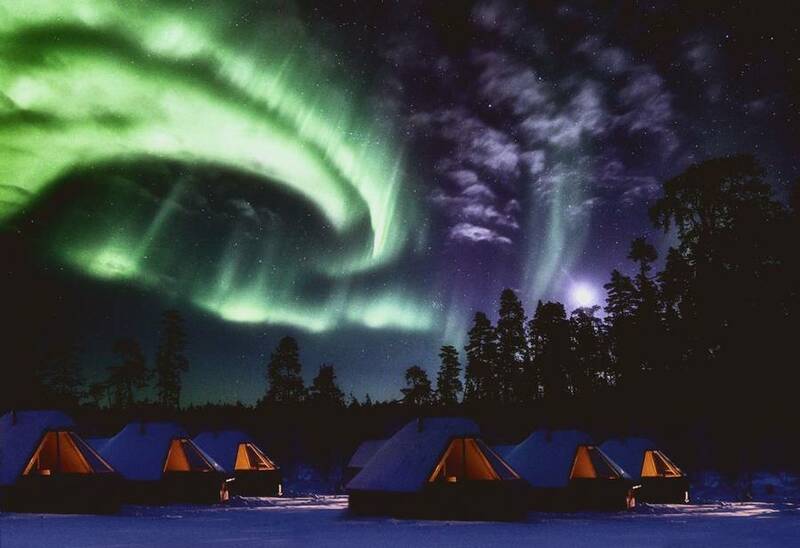 The Northern Lights Village is only 1000 metres from the ski town of Saariselkä. There are numerous shops, restaurants and cafés to enjoy here as well as a good selection of ski slopes and cross-country skiing trails. 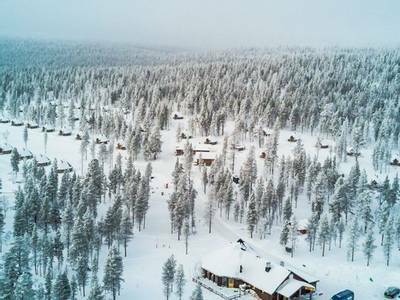 So during one day, we give you some free time to enjoy the sights and sounds of Saariselkä or perhaps take to the downhill ski slopes there for some alpine action. The daytime highlight, however, has to be the husky safari which we have included. This is an unforgettable ride, as you take control of a team of huskies with your partner for a thrilling dog sled trip into the Arctic wilds. 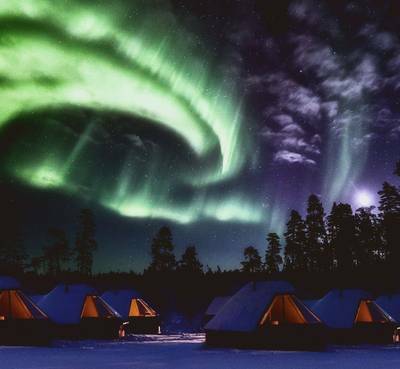 This combination of Aurora accommodation and dedicated Northern Lights hunts means you really maximise your viewing opportunities during this three-night trip. The daytime options and the husky safari provide a wonderful cherry for your short-break cake. 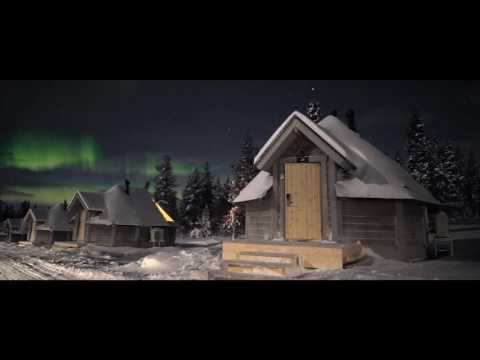 On arrival at Ivalo Airport, you will be transferred to your accommodation at the Northern Lights Village and can check into your Aurora Cabin. 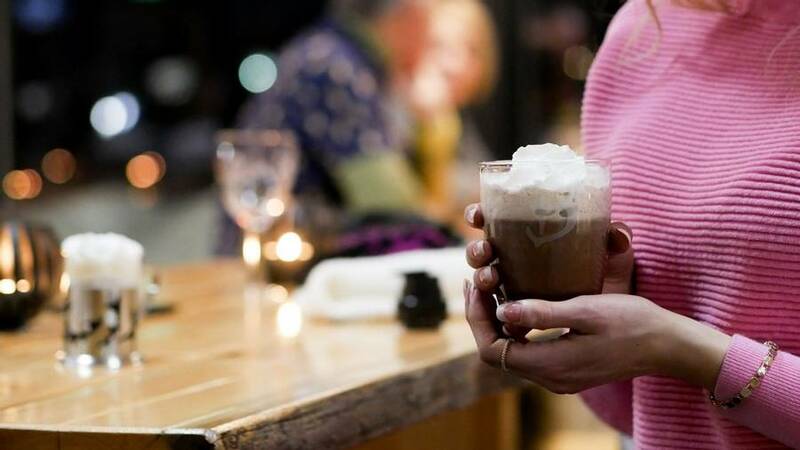 You will be served an evening meal in the restaurant before embarking on your first Northern Lights hunt. Tonight’s inaugural hunt will last around three hours and will involve making a journey to the Aurora Camp at Lake Rahajarvi by bus. You will stop at vast Lake Inari en-route and will hear about the lake’s importance to the region and the indigenous Sámi people of Lapland. 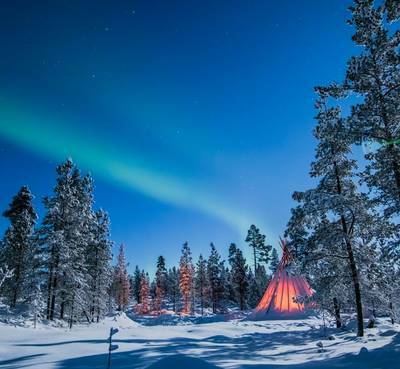 Once at the camp, you will keep warm by the fire and enjoy a hot drink and snacks with your guide providing some information regarding the Northern Lights and answering any questions you may have. At the camp, the anticipation will begin to build and you will search the skies for any glimmers of green. 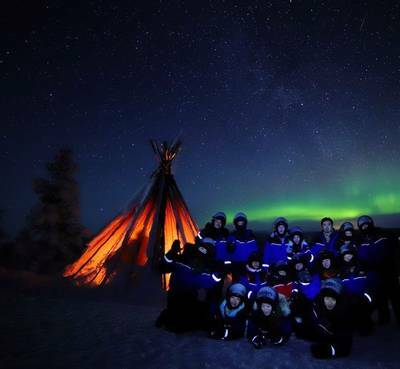 If you are lucky enough to witness a display begin, then you can grab a reindeer hide, lie down in the snow and enjoy a captivating show as the lights dance overhead. Following breakfast, the day is yours to spend at leisure. 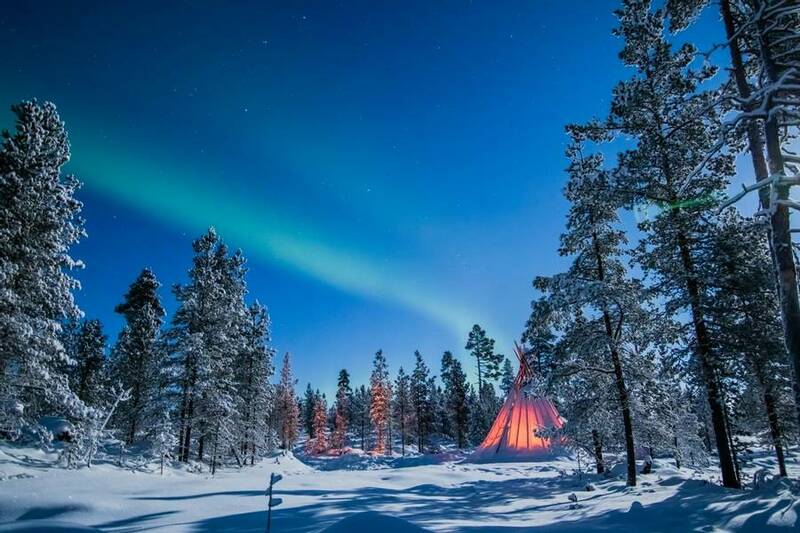 The Northern Lights Village is approximately 1000 metres away from the ski resort town of Saariselkä and, despite been 250 km north of the Arctic Circle, Saariselkä has much to offer. There are shops, restaurants and cafés to enjoy as well as downhill ski slopes if you fancy some alpine action. 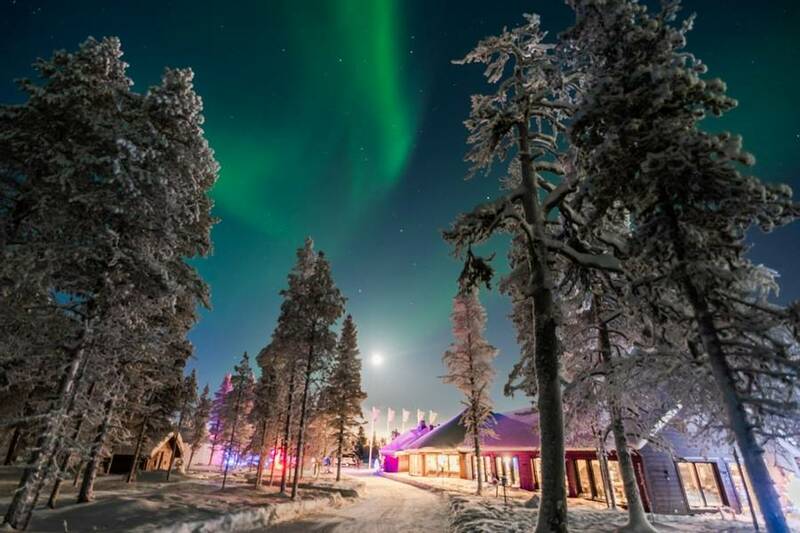 If you prefer to stay onsite, then the Northern Lights Village has a reindeer paddock close to the restaurant (where your lunch will be served). Follow the jangling of bells and you will be greeted by these furry nosed animals. 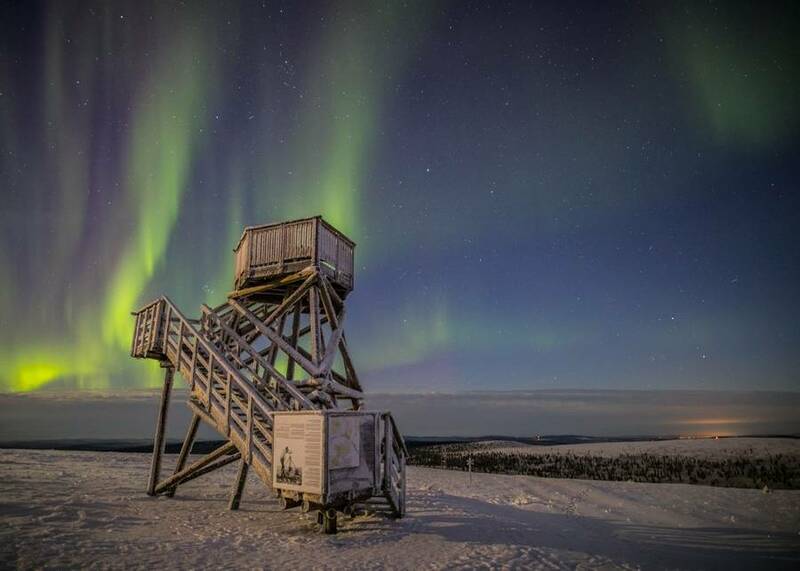 During the evening, you will venture out into the wilderness which lies on the doorstep of the Northern Lights Village for a Northern Lights snowshoe hike. 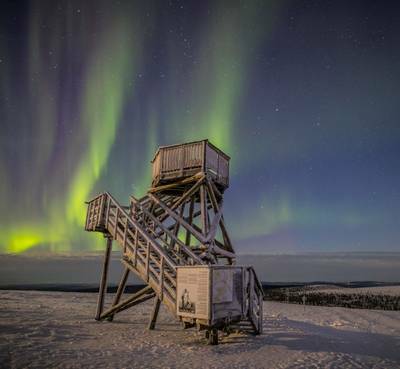 This is an invigorating and peaceful way in which to hunt the Aurora and your guide will lead the way to a perfect viewpoint. Here, you will stop and build a fire and enjoy snacks and hot drinks as you watch the skies in this most incredible location. After breakfast, you will enjoy a wonderful taster of the most eagerly anticipated winter activities; a 5 km dog sled safari. 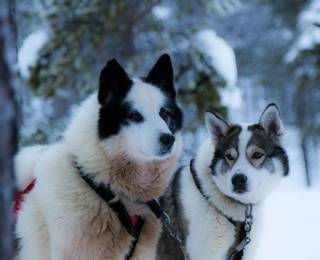 Huskies are synonymous with the Arctic and a husky safari is the epitome of a winter adventure. The huskies are eager to run and you will not fail to notice their excitement as they bark and howl in anticipation, straining to get going. You might expect this to continue as the safari gets underway, but this is not the case, as the dogs are soon focused only on running. Full instruction will be provided before you take to the trails, travelling two people per sled. This activity lasts around one and a half hours in total (including transfers and instruction). We expect you to be out on the husky sledges for around 20 – 30 minutes in total. There are much longer safaris if you would like to enjoy more time out on the trail. If you would like to extend and spend more time with the dogs then please see the ‘Personalise’ section of the holiday page for more details. Following the husky safari, you will enjoy lunch at the restaurant before a final Aurora hunt. Following dinner this evening you have the choice of two activities. 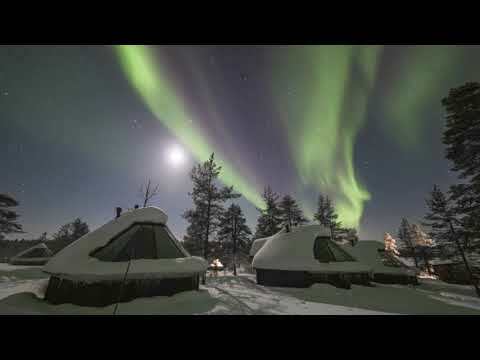 Option one is a visit to an Aurora Camp close to the Russian border. The four-hour activity will begin with a bus journey through the small villages of Ivalo and Nellim. Once at the border you will walk an extra kilometre towards Paatsjoki Bridge (a prime viewpoint), before settling down by a roaring campfire. Hot drinks and snacks are included. 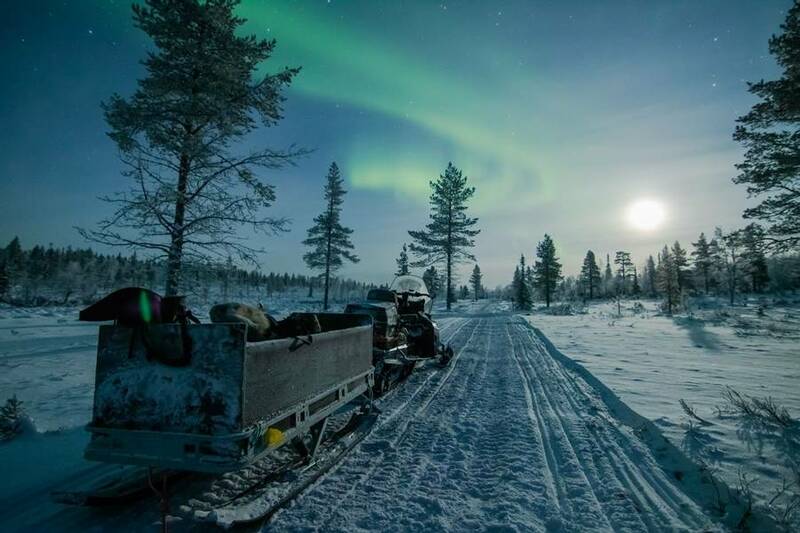 The more adventurous option is a Northern Lights snowmobile safari lasting around three hours. After a full safety briefing and driving instruction, you will follow your guide, travelling two per snowmobile, in search of the Northern Lights. You’ll travel into the fells and once at the top, you will keep warm by an open fire and enjoy hot drinks. Please note that the driver of a snowmobile must be at least 18 years old and hold a valid driving licence. Today it is time to bid farewell to Lapland and you will be transferred back to Ivalo after breakfast for your return flights home. If you are on the early flight, a packed breakfast will be provided. 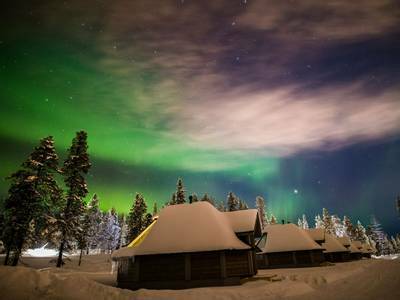 Located in North East Finland, the Northern Lights Village sits on the outskirts of the ski resort of Saariselkä. 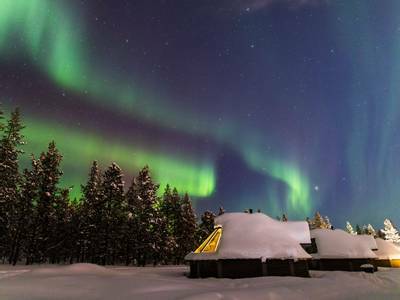 Tucked away from the town and separated from it by dense forest, the location is ideal for viewing the Northern Lights but is still within walking distance (around 1000m) of the town’s amenities. The ski slopes can be accessed via a shuttle (small charge applies) or a pleasant walk of around 40-50 minutes. The village restaurant is an atmospheric place, inspired by traditional wooden kotas (Finnish teepees). Breakfast is a buffet of continental options and some hot dishes. Evening meals are a buffet with starters of soups and salad, a choice of local meat or fish will follow (the reindeer and white fish in this region are delicious!). Typically a cake will be served for pudding, keeping you well-fuelled for your nocturnal Aurora hunting adventures. Dietary requirements are all well-catered for as long as we are informed at the time of booking. There’s also a large lobby near reception for you to relax in after your meal. 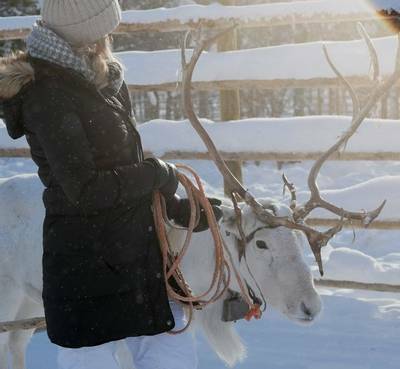 The Northern Lights Village has an onsite reindeer farm and all activities (including the reindeer safaris) start in the village so there is no need for time-wasting transfers. Basically, because we want to make your holiday as uncomplicated as possible, life is made very easy here. 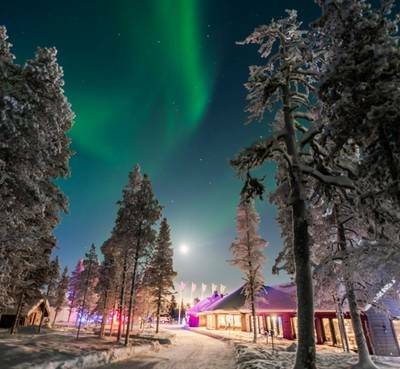 The Northern Lights Village is home to a herd of reindeer and you can watch them go about their business as you eat breakfast in the restaurant. 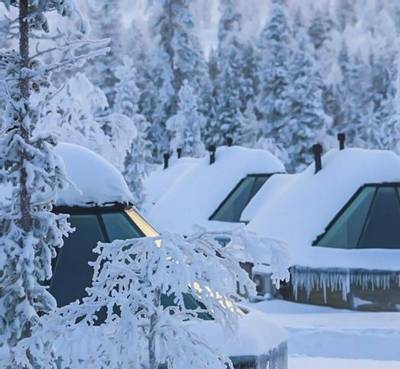 Saariselkä is around a 20-25 minute walk from the Northern Lights Village (40-50 minutes to the ski slopes) which means that all of the amenities, shops, cafés and local restaurants are within easy reach. For all Northern Lights activities, an expert guide will provide you with photographic tuition. If you do not have an SLR camera and tripod then they can both be rented locally. The guides sometimes take pictures throughout the activities which can be purchased on your return to the village, if they take any. There’s also the option to rent an Aurora Alert buzzer which will vibrate, ring and flash when Auroras are visible during the night. This is payable locally, please contact our Travel Experts for more information. For all of your provided winter clothing, simply go to the onsite Safari House where overalls, gloves, boots, skis and snowshoes are stored for easy access. 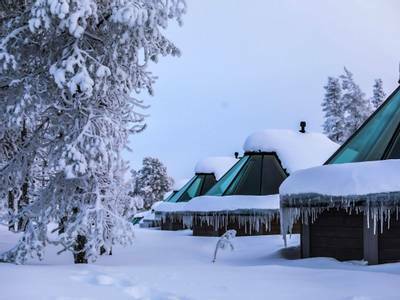 Guests can pay extra to use the hot tub, sauna and ice pool. This can be used during public time or booked for private use. The Aurora Cabins have a half-glass roof and all face north. The design is based on the traditional wooden kotas (teepees) of Finland and has been specifically created for the village. 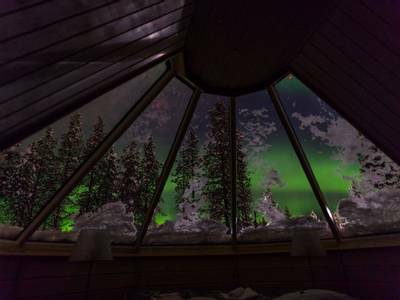 Importantly for duvet-based Aurora hunting, a timer switch can be used to heat the glass roof should your view be obscured by snowfall. It takes approximately 5-10 minutes to heat and melt the snow so there’s no need to go and sweep the roof in your pyjamas! 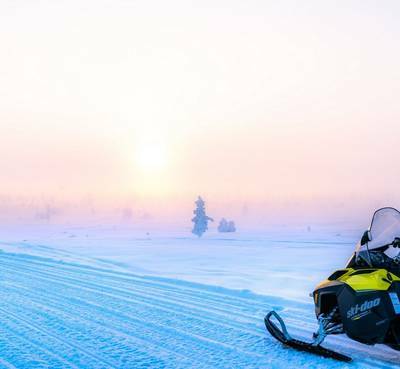 For those who want to explore much further afield then look no further as this 4-hour snowmobile safari will take you out into the wilderness beyond Saariselkä. Full instruction will be provided along with a safety briefing from your expert guide and then you’ll set off in convoy, following the marked trails and travelling two per snowmobile. Your guide will prepare a campfire lunch for you en route. If you would prefer to travel in a sleigh, which is pulled by the guide’s snowmobile, a discounted price applies. Please speak to our Travel Experts for full details. Please note: Snowmobile drivers must be 18 years old and hold a valid driving licence. Available: Monday - Sunday at 10 am from December until mid-April. Please note that the time may vary throughout the season. After a full safety briefing and tuition, you will drive two per snowmobile into the winter wonderland beyond. Stopping at a remote lake, your guide will introduce you to ice fishing and you will have the chance to try your hand at this Lappish pastime. Your guide will build a campfire and lunch will be served. We know that for some people the thought of snowmobiling may be a little daunting so this short 2 hour (approximate) safari provides the ideal introduction. Full instruction will be provided along with a safety briefing from your expert guide and then you’ll set off in convoy, following the well-marked trails and travelling two people per machine. 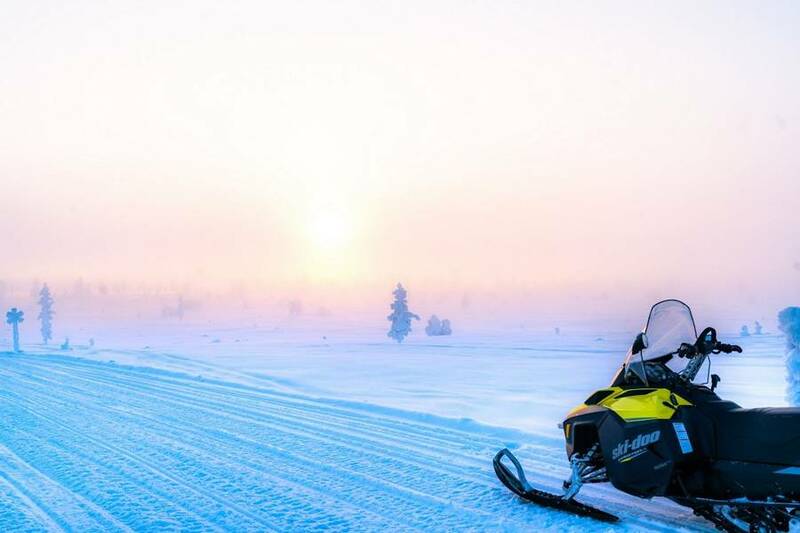 Snowmobiles offer the chance to explore further afield and offer the passenger (you can swap drivers) the chance to fully enjoy the sights of Lapland. 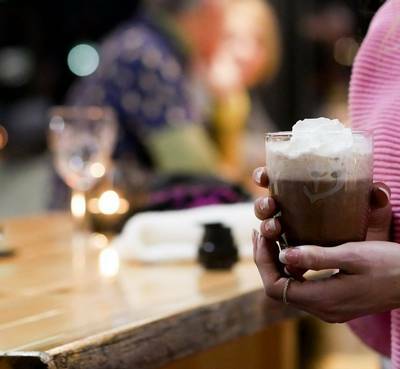 There will be a break for you to enjoy warm drinks and snacks along the way. Available: Monday - Sunday at 10 am, 1 pm & 3 pm from December until mid-April. Please note that the times may vary throughout the season. The beauty of snowshoeing is that it provides the chance for wildlife encounters, as the local flora and fauna will not be scared off by the noise of engines or the sound of sleds. So, for nature lovers, this is an ideal choice as your local guide will provide information on the wildlife and its natural environment. You may have the chance to witness Siberian Jay, willow grouse or a herd of roaming reindeer. You will also enjoy a light campfire lunch in the great outdoors to refuel you halfway through the walk. Reindeer have played an integral role in the local economy and culture for many, many centuries. An understanding of these animals and their herders is something no visitor to the region should miss. You will meet with a local reindeer herder and hear tales from the trails as you learn about reindeer husbandry. You’ll get the chance to feed the animals before enjoying a 25 min (approximately) reindeer-pulled sleigh ride. The reindeer and sled will be under the control of your guide leaving you free to capture it all on camera and enjoy the sights and sounds of this atmospheric experience. Following your farm visit, lunch will be served in the main restaurant at the Northern Lights Village. Available: Monday to Sunday at 10 am from December until mid-April. Please note that the time may vary throughout the season. This twenty-five-minute or two hour reindeer-pulled sleigh ride will take you on a journey around the reindeer paddock and the surrounding woodland, giving you the chance to see these animals from a new perspective. Your experienced driver will control the sled, leaving you free to soak up the sights and sounds. You have the option of picking a 25 minute or two-hour reindeer sleigh ride. 25 minutes (approximately): £62pp available from Monday - Sunday at 9 am, 11 am, 1 pm and 3:30 pm from December until mid-April. Please note that the times may vary throughout the season. 2 hours (approximately): £133pp available from Monday - Sunday at 10 am, 1 pm and 3 pm from December until mid-April. Please note that the times may vary throughout the season. A husky safari is one of those experiences you are likely to remember for the rest of your life. Once the dogs are running and the sleigh enters the wilderness, all else is forgotten. It is one of those activities that you don’t want to end and extending your safari will prolong the adventure and allow you to venture further out into the snow-covered landscapes. The dogs will be more than willing to accommodate you. You will ride 2 people per sled. If you would like to take control of your own team of huskies then we can arrange this for you. Please ask our Travel Experts for a quotation. Price based on a single traveller in their own cabin but sharing a husky sled, a snowmobile (if Aurora snowmobile selected on day 3) and group transfer. If you would like to drive your own husky team or snowmobile, please ask our Travel Experts for a quotation. Read more were only there for 3 days but really enjoyed them all from snow shoeing, to husky sledding and snow billing. We also thought it was fantastic to have some ski slopes so close to the village, so we took up this opportunity and did some skiing too! The guides and all other staff were brilliant, really knowledgeable and helpful throughout our stay. We had a wonderful holiday and loved the Aurora Cabins. The sparkling wine in our cabin when we arrived to mark my wife's Birthday was a lovely touch. Thank you. Unfortunately, we didn't see the Aurora but we cannot complain as we had a great time. The guides' knowledge about wildlife, the local area and their activity was super. This has been one of the best experiences I have ever had. I would definitely like to visit Finland again. Everything was perfect!! Thank you all for providing us with an incredible holiday!